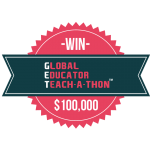 Competition to award grand prize of $100,000 to inspire educators to share their knowledge in 10 min. 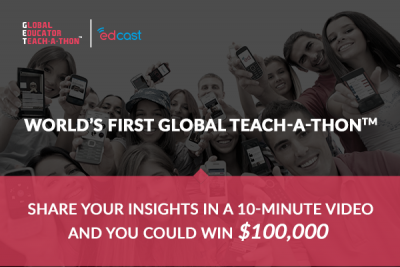 SAN DIEGO, April 19, 2016 – Future Learning Lab has partnered with EdCast to announce the launch of the Global Educator Teach‐A‐Thon, a new annual competition for educators to showcase the impact and power of social learning technology. Designed to challenge professional and independent educators to embrace the sharing economy, The Global Educator Teach‐A‐Thon is the first ever open‐knowledge viral challenge to help students and adults worldwide to learn from free open content. Educators and those with a passion for a specific subject or discipline are invited to demonstrate their teaching acumen by recording and uploading short video lessons from their smartphone. The educator(s) who garner the highest user engagement will win the grand prize of $100,000. Additional partners include: Arizona State University, The KIPP Foundation, Reach Newschools Capital, Pencils of Promise, the Sustainable Development Solutions Network, Teach For All, Teach For America, and Tata Trusts. Participation is free, and all interested applicants can visit www.edcast.com/corp/GET for more information. All interested educators will be contacted regarding their selection to participate. EdCast is a social knowledge network built to enhance the human ability to learn and get smarter. EdCast Knowledge NetworksTM power social, mobile and cloud‐based learning for world‐class institutions, enterprises, governments and nonprofits and enables millions of lifelong learners to gain knowledge every day. The EdCast executive team has a track record of building large‐scale transformational technology; all are passionate about the global impact of mobile and online learning. EdCast is a Stanford StartX company backed by tier one VC firms. The Company is based in Mountain View CA, with offices worldwide.